We have some lovely entries to this edition of the Charlotte Mason Blog Carnival! Because so many of the entries relate to nature and the outdoors, we are dedicating this edition to Nature Study. 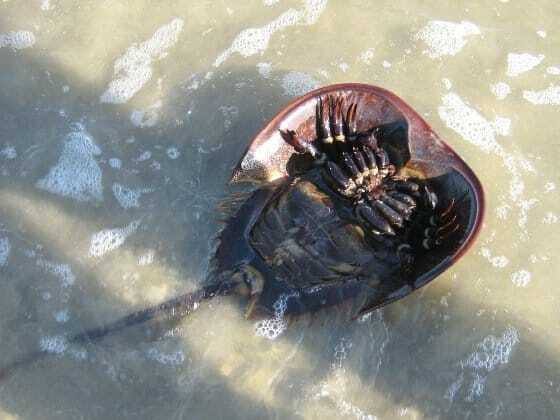 A horseshoe crab washing up in the surf. We are fortunate enough to live near the Atlantic Ocean. So of course we had to study Marine Biology! Studying the tides, netting and studying various creatures and their habitats first hand has been a marvelous experience. Barb-Harmony Art Mom and family give us a insightful example of studying cattails through the fall, winter, spring and summer as suggested in the classic Handbook of Nature Study. Read her post The End of Our Year-Long Cattail Study posted at her gorgeous blog, Handbook of Nature Study. Barb-Harmony Art Mom presents a second article recounting her trials and insights in Planning Astronomy Gives Me a Good Thump on the Head posted at her second blog, Harmony Art Mom. Sharing two posts with us today is Tricia Hodges. First, she exhorts us to enjoy learning with our children her post Deliberate Delight – Nature Study about their summer natures studies posted at Habits for a Happy Home. Tricia also shares with us a second article this edition called Butterfly – A Pastels Tutorial posted at her other blog, Hodgepodge. Pamela presents a photo essay of her family’s trip to Mission San Miguel as they study California history, posted at Blah, Blah, Blog. Jennifer Lavender welcomes the Charlotte Mason community to take part in discussing her writings in her article How to Use This Blog posted at Charlotte Mason Series. Nancy presents Enigmas on the Prairie, her reflections after attending the recent Living Education Weekend retreat, posted at Sage Parnassus. Melissa presents a book list…decisions, decisions! posted at Bugs, Knights, and Turkeys in the Yard. Chi-ann Rajah offers an inside look into one of her family’s favorite habits in her article Teatime Tuesday posted at A Pilgrim’s Heart. Amy in Peru lets us take a peek at her Book of Centuries and Timelines Galore posted at Fisher Academy International ~ Teaching Home. Jamie offers this insightful post Creative Capacity at her blog See Jamie Blog. Allow some time to watch the video – the insights it offers to our current educational system will give you plenty to think about! Thank you for visiting this edition of the Charlotte Mason Blog Carnival! Come again! What a writeup!! Very informative and also easy to understand. Looking for more such comments!! Do you have a facebook? I recommended it on digg. The only thing that it’s missing is a bit of speed, the pictures are appearing slowly. However thank you for this blog. Love the feel of your blog. You mind sharing the name of the themeyou are using? Thanks a lot, Joanne. Thanks to Clementine, Hogarty, Reed and Rima, for visiting and taking a minute to comment. Most appreciated! Thanks for your comments, Nancy (your kids DEFINITELY have a cool grandma! ), Tricia, Melissa, Michelle, Lizzie, Chi-ann (please write for us again!) and Jimmmie – so good to hear from you! Glad to hear you arrived back home in China safe and sound. Looking forward to see more of the results of the art lessons! 🙂 Thanks for commenting! My first experience seeing the ocean was on Myrtle Beach, NC. (I was around 12.) I vividly remember the horseshoe crabs. We never see those on Asian beaches, of course. They are such fascinating creatures. I’m so excited to be part of the carnival (first time!) and I’m really enjoying all the posts! Thanks for hosting! Thank you for hosting:) I enjoyed your photos. Looks like a lot of great stuff this time around…as usual! Can’t wait to get to it all! Glad you shared your beautiful pics! Thanks for hosting! I’m looking forward to reading over afternoon coffee 🙂 Thanks for sharing your beach view, treasures (?) and topping it off with hydrangeas. Our hydrangeas are about spent too. But a different kind of ‘heading into fall’ pretty, I’d say. Thanks for hosting this carnival! Horseshoe crabs are a favorite here in MN. Grandma brought one back from Cape Cod in her suitcase, just so the children could see one! Yes, it smelled – but the kids have the coolest grandma evah. The next year in SC, the kids came across a bunch of tourists poking a live one with a stick. The 11 year old walked up, pick it up and started explaining its parts. I love a CM education, don’t you? Thank you, Barb! I like to be able to read it through as well! Enjoy your hydrangeas. Ours are just about spent as hot as it has been here – you probably get to enjoy yours longer. Thanks for your posts and for stopping by! Thanks, Jamie! I enjoyed your post – I had heard that talk before but I really needed to hear it again. Thanks for sharing! Looks like a great carnival. 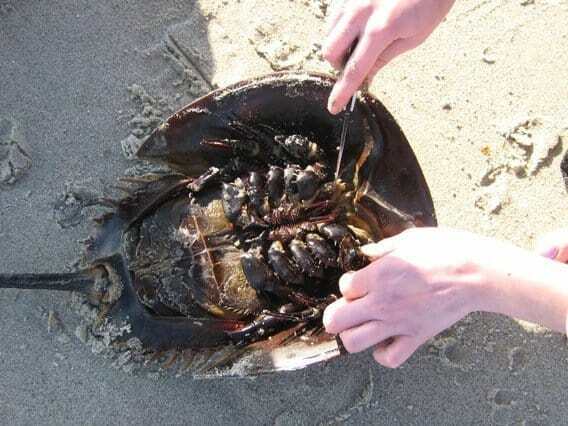 Those horseshoe crab pictures are great (but kinda gross me out, too! )!